In the wake of the mortgage foreclosure crisis and the long-term abandonment of older industrial cities and their regions, communities and neighborhoods have been increasingly burdened with vacant and abandoned properties. Organizations and municipalities are now more systematically addressing vacant residential properties. However, for years there was very little guidance for the redevelopment of commercial vacant properties, which are equally prevalent — especially throughout older industrial regions. 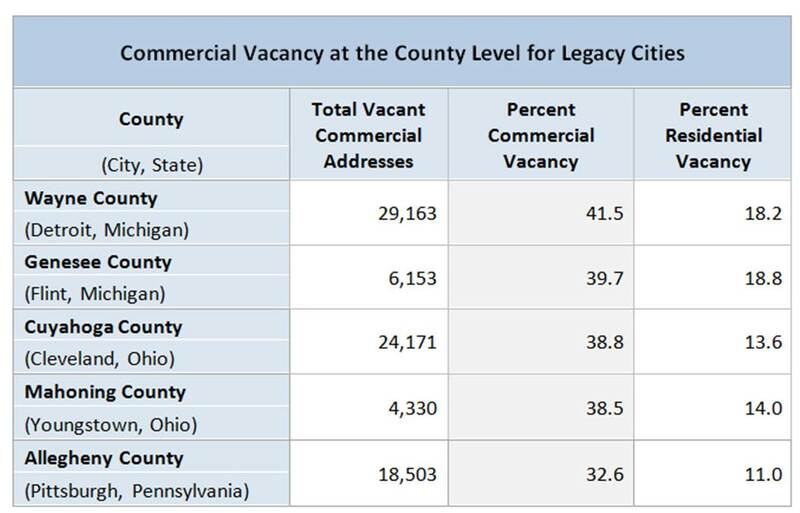 Commercial and residential vacancy at the county level for legacy cities. Data collected on the fourth quarter of fiscal year 2013. Data source: US Postal Service. Data aggregates vacant and no-stat addresses. Greater Ohio Policy Center just released its new guidebook, Redeveloping Commercial Vacant Properties in Legacy Cities: A Guidebook to Linking Property Reuse and Economic Revitalization, which is the first of its kind to offer a comprehensive set of tools and strategies for redeveloping commercial vacant properties and business districts in legacy cities. The guidebook, developed in partnership with the German Marshall Fund of the United States and with support from the Center for Community Progress, is designed as a “How To” manual for local leaders, identifying practices and policies that take advantage of the link between available commercial properties and needed economic re-growth strategies in legacy cities. The tools and strategies provided can be used by local leaders and practitioners no matter where they are in the process of commercial property redevelopment, from data gathering and planning to real estate acquisition and redevelopment, and from tenant attraction and support to business district management. Click here for more information and to download the guidebook.